Being an Islamic country, Pakistan is the land of millions mosques. About 1200000 mosques in Pakistan. Some of the mosques are quite famous because of their size, beauty, architecture and history. The following is a list of mosques in Pakistan. Bait ul Atiq Mosque Lahore, Punjab A Mosque adjacent to a Shia Seminary, Jamia Urwa-tul-Wusqa, Lahore. Begum Shahi Mosque Lahore, Punjab 1,600 m2 (17,000 sq ft) 1614 Begum Shahi Mosque is an early 17th-century mosque situated in the Walled City of Lahore. The mosque was built between 1611 and 1614 during the reign of Mughal Emperor Jahangir in honor of his mother. .
Faizan-e-Madinah Karachi, Sindh 20,000 10,000 m2 (110,000 sq ft) 1999 A Mosque and education center run by Dawat-e-Islami. One of the largest mosques in Pakistan covering over 10,000 m2 with a capacity of over 20,000. Wikimedia Commons has media related to Mosques in Pakistan. Look up Mosque in Wiktionary, the free dictionary. ^ "15 Most Amazing and Beautiful Mosques in Pakistan". 5 October 2016. Retrieved 1 August 2018. ^ "Abbasi Mosque at Derawar Fort". Beautifulmosque.com. Retrieved 26 June 2018. ^ "Built by Nawab Bahawal Khan in 1849". www.dawn.com. Retrieved 24 June 2018. ^ Desk, Interactive (10 January 2016). "9 historical Pakistani mosques that will transport you to another time". ^ "Masjid-e-Aqsa - Rabwah, Pakistan". Retrieved 1 August 2018. ^ Shahzad Bashir. Messianic Hopes and Mystical Visions: The Nåurbakhshåiya Between Medieval. ^ "Badshahi Mosque, Lahore". www.pakistantoursguide.com. Retrieved 26 June 2018. ^ Meri, Joseph (31 October 2005). Medieval Islamic Civilization: An Encyclopedia. Routledge. p. 91. ^ "Badshahi Mosque". Ualberta.ca. Retrieved 2 January 2014. ^ "Begum Shahi Masjid". Retrieved 1 August 2018. ^ "Begum Shahi Masjid". Pakistan Today. 12 March 2016. Retrieved 31 August 2016. ^ Gibb, H. A. R. (1954). The Encyclopaedia of Islam. Brill Archive. Retrieved 30 August 2016. ^ "Bhong Mosque". Retrieved 1 August 2018. ^ "Two of the oldest mosques of Pakistan". Blogs.dunyanews.tv. Retrieved 26 June 2018. ^ "Chaqchan Mosque, Khaplu". www.pakistantourism.com. Retrieved 26 June 2018. ^ Afridi, Banat Gul (1988). baltistan in history. ^ "JHELUM- THE CITY OF SOLDIERS". Retrieved 1 August 2018. ^ "Dai Anga Mosque". Lahore Sites of Interest. ^ "DAI ANGA MOSQUE - 1635". Retrieved 1 August 2018. 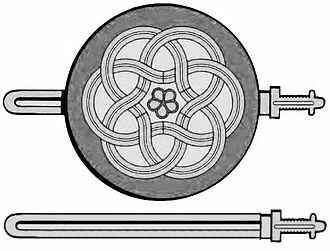 ^ Halafoff, Anna; Clarke, Matthew (2016). Religion and Development in the Asia-Pacific: Sacred Places as Development Spaces. Taylor & Francis. ISBN 9781317647454. Retrieved 12 September 2017. ^ Quraeshi, Samina (2010). Sacred Spaces: A Journey with the Sufis of the Indus. Peabody Museum Press. ISBN 9780873658591. Retrieved 12 September 2017. ^ "Data Darbar Complex". Retrieved 1 August 2018. ^ "Faisal Mosque - Islamabad, Pakistan". 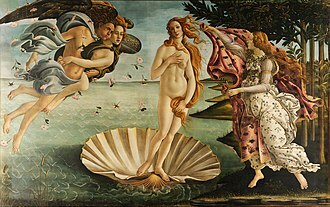 www.sacred-destinations.com. Retrieved 2016-11-17. ^ "KING OF ALL MOSQUES – FAISAL MOSQUE". Retrieved 1 August 2018. ^ "Groundbreaking ceremony". The Nation. 7 January 2015. Retrieved 17 December 2015. ^ "Bahria breaks ground on world's 3rd largest mosque". The Express Tribune. 7 January 2015. Retrieved 17 December 2015. ^ "Karachi: Foundation stone of world's 3rd largest mosque laid - Pakistan - Dunya News". dunyanews.tv. Retrieved 17 December 2015. ^ "Grand Mosque, Allahabad". www.islahulmuslimeen.org. Retrieved 10 October 2018. ^ "Pakistan's third largest mosque,". timesofindia-economictimes. Retrieved 17 December 2015. ^ "Unparalleled achievement: Zardari inaugurates Pakistan's largest mosque". The Express Tribune. 15 October 2014. Retrieved 17 December 2015. ^ "Beautiful Mosque Pictures". www.beautifulmosque.com. Retrieved 2016-10-25. ^ Kit W. Wesler (19 April 2012). An Archaeology of Religion. University Press of America. p. 253. ISBN 978-0761858454. Retrieved 8 September 2012. ^ "Friday Mosque of Banbhore". ArchNet. Retrieved 8 September 2012. ... the Jami' Masjid of Banbhore is one of the earliest known mosques in the Indo-Pakistan subcontinent. ^ "Banbhore Museum". Culture Department. Govt. of Sindh. Retrieved 3 September 2012. ^ "Jamia Mosque (Khudabad) in Dadu District". www.sindhidunya.com. Retrieved 13 October 2018. ^ "Profile: Islamabad's Red Mosque". BBC. July 3, 2007. Retrieved January 5, 2010. ^ "The legacy of Lal Masjid". Retrieved 1 August 2018. ^ "Mahabat Khan Mosque". Pharos:Research Journal of the Shaykh Zayed Islamic Centre. University of Peshawar. 3 (11). 1996. Retrieved 15 September 2017. ^ "AROUND TOWN: Masjid Mahabat Khan: Splendour of Mughal art". Dawn. 5 December 2008. Retrieved 15 September 2017. ^ "What is the capacity of the prayers that can be accommodated by the mosque?". Retrieved 1 August 2018. ^ Shinwari, Sher Alam (2015-06-24). "Facts and fiction surrounding the historic Masjid Qasim Ali Khan". Dawn. Retrieved 2018-12-17. ^ Dar, Nadeem (20 June 2015). 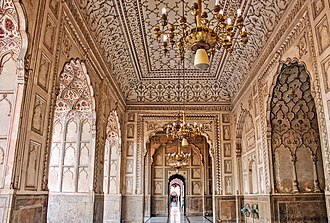 "A pearl inside Lahore Fort – Moti Masjid". Pakistan Today. Retrieved 6 January 2017. ^ Lahore Fort Complex: Moti Masjid Archived 25 May 2011 at the Wayback Machine at ArchNet. Retrieved 16 April 2008. ^ "Neevin Masjid – the 8th wonder". Retrieved 1 August 2018. ^ Dar, Nadeem (5 July 2015). "An architectural wonder, 25 feet under". The News (Pakistan). Retrieved 21 December 2016. ^ Qureishi, Tania (16 January 2016). "Neevin Masjid – the 8th wonder". Pakistan Today. Retrieved 21 December 2016. ^ "OONCHI MASJID OF BHATTI GATE — ANOTHER WONDER LOST WITH THE PASSAGE OF TIME". Retrieved 1 August 2018. ^ Sluglett, Peter (2015). Atlas of Islamic History. Routledge. ISBN 9781317588979. ^ a b "SHAH JAHAN MOSQUE". Retrieved 1 August 2018. ^ "Shah Jahan Mosque, Thatta". Retrieved 1 August 2018. ^ Yousaf, Mohammad (1971). A Brief History of Multan. Ferozsons. ^ "Shahi Mosque, Chitral". www.croozi.com. Retrieved 5 July 2018. ^ "Information on alamy.com". www.alamy.com. Retrieved 5 July 2018. ^ "Built in 1924 by Shuja ul Mulk". www.alamy.com. Retrieved 28 May 2018. ^ "Mehtar of Chitral from 1895 to 1936". www.dilkashpakistan.com. Retrieved 18 June 2018. ^ "Sonehri Mosque". Lahore Sites. Retrieved 28 August 2016. ^ "Sonehri Mosque". Retrieved 1 August 2018. ^ "Masjid-e-Tooba – All You Need To Know!". Retrieved 1 August 2018. ^ "MASJID-E-TOOBA". Retrieved 1 August 2018. ^ "Conservation of the Wazir Khan Mosque Lahore: Preliminary Report on Condition and Risk Assessment" (PDF). Aga Khan Development Network. 2012. Retrieved 25 August 2016. ^ "Wazir Khan's Mosque, Lahore". UNESCO. Retrieved 4 May 2015. The Mosque of Mariyam Zamani Begum, commonly referred to as Begum Shahi Mosque, is a mosque situated in the Walled City of Lahore, Pakistan. It is one of Lahores earliest surviving examples of a Mughal-era mosque, the mosque has been encroached upon by several shops, and views of the mosque from the Akbari Gate of the Lahore Fort have been obstructed by illegally constructed tyre shops. In July 2016, the Walled City of Lahore Authority announced that the shops would be removed, the mosque was built during the reign of Mughal Emperor Jahangir in the honour of his mother, Begum Mariyam Zamani, who was known as Maharani Jodha Bai. Mariyam Zamani was wife of Mughal Emperor, the mosque is located inside the old Masti Gate in the Walled City of Lahore. Construction began in 1611 and lasted until 1614, the Mosque of Mariyam Zamani was temporarily turned into a gunpowder factory by Maharaja Ranjit Singh, for which it was known as Barudkhana Wali Masjid. In 1850 the mosque was returned to the Muslims of Lahore who were able to contribute to its renovation, short domes and wide arches represent the earlier Lodi style, while the mosques balconies, side rooms, and embellishment are in the Mughal style. The mosque features Lahores first five-bay prayer chamber that would be typical of all Mughal mosques such as the Wazir Khan Mosque, the mosques central bay is in the style of the Persian Char Taq, and is flanked by one smaller dome on either side. The mosques prayer chamber is 130.5 feet long, and 34 feet wide, the hall is divided into 5 bays, topped by three arches - the largest of which is over the central bay. The mosque features a courtyard which has a pool for Islamic ritual washing. The interior of the mosque features extensive Mughal fresco work, and would be the model for the elaborate, most frescoes are floral in design, and calligraphy on the walls includes non-Quranic text, and is the first mosque in Lahore to feature this practice. The northern gateway features a Persian inscription which reads, God be thanked through whose grace, under the auspices of His Majesty, the founder of the edifice, the place of salvation, is the Queen Mariyam Zamani. 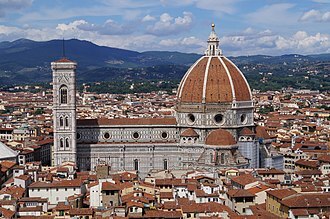 For the completion of this edifice, which resembles paradise, I was thinking about when at last I found it in the words What a fine mosque. Bahawalpur, is a city located in the Punjab province of Pakistan. Bahawalpur is the 12th largest city in Pakistan with a population of 798,509. The city lies near the ancient Derawar Fort in the Cholistan Desert near the border with India, Bahawalpur was once the capital of the former princely state of Bahawalpur ruled by Nawabs. The Nawabs of Bahawalpur were regarded as part of the Rajputana States, the Nawabs bestowed Bahawalpur with several monuments, such as the palaces of Noor Mahal, Sadiq Ghar Palace, and Darbar Mahal. Bahawalpur was founded in 1748, in a region near the city of Uch. 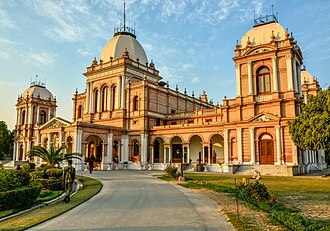 The princely state of Bahawalpur was founded in 1802 by Nawab Mohammad Bahawal Khan II after the break-up of the Durrani Empire, and was based in the city. 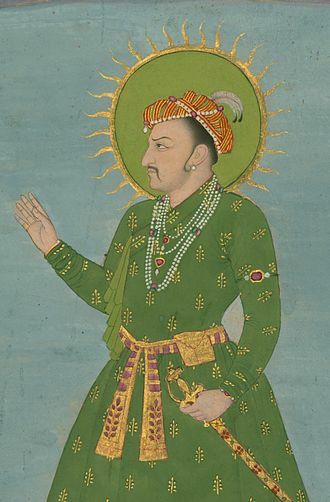 Nawab Mohammad Bahawal Khan III signed a treaty with the British on 22 February 1833, guaranteeing the independence of the Nawab and the autonomy of Bahawalpur as a princely state. 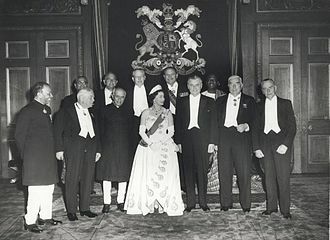 The city and princely state acceded to Pakistan on 7 October 1947 when Nawab Sadiq Muhammad Khan Abbasi V Bahadur joined Pakistan at the time of the independence of Pakistan in 1947. Following independence, the citys minority Hindu and Sikh communities largely migrated to India en masse, while Muslim refugees from India settled in the city and surrounding region. Bahawalpur lies immediately south of the Sutlej River, and is the site of the 4,250 foot long Empress Bridge - the only bridge over the Sutlej in Pakistan. The city is situated 90 km from Multan,420 km from Lahore,122 km from Burewala,90 km from Vehari,270 km from Faisalabad and about 700 km from the national capital, the region is primarily arid desert with low annual rainfall totals. Regions to the west of the city are fertile alluvial tracts irrigated by the Sultej River, east of Bahawalpur is the Pat, or Bar - a tract of land at considerably higher altitude than the adjoining valley. Farther east, the Cholistan, is a desert tract, bounded on the north and west by the Hakra depression with mound ruins of old settlements along its high banks. The citys climate is hot and dry. In the summer the temperature reaches the high 40s during the day, the average temperature in summer is 33 °C, and 18 °C in winter. The Badshahi Mosque is a Mughal era mosque in Lahore, capital of the Pakistani province of Punjab. The mosque is located west of Lahore Fort along the outskirts of the Walled City of Lahore, the mosque is widely considered to be one of Lahores most iconic landmarks. Badshahi Mosque was commissioned by Emperor Aurangzeb in 1671, with construction of the mosque lasting for two years until 1673, the mosque is an important example of Mughal architecture, with an exterior that is decorated with carved red sandstone with marble inlay. Upon completion, it became worlds largest mosque and remained so for 313 years until the expansion of Prophets Mosque and it remains the largest and most recent of the grand imperial mosques of the Mughal-era, and is the second-largest mosque in Pakistan. After the fall of the Mughal Empire, the mosque was used as a garrison by the Sikh Empire and the British Empire, the mosque is located adjacent to the Walled City of Lahore, Pakistan. The mosque is located next to the Roshnai Gate, one of the original thirteen gates of Lahore. Also located near the entrance is the tomb of Sir Sikandar Hayat Khan. 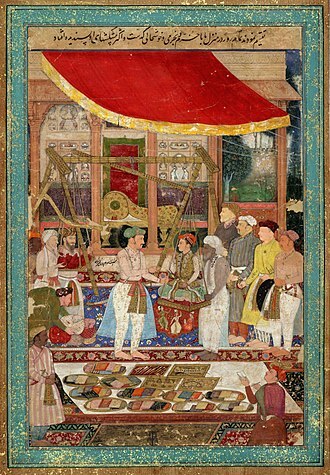 Lahore was considered a center as it protected the empire from potential invaders from the west. The city was made a capital by the earlier Emperor, Akbar. 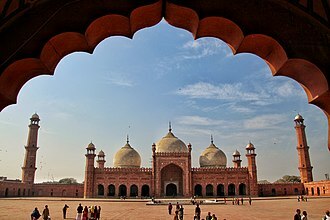 The sixth Mughal emperor, chose Lahore for as the site for his new imperial mosque, the mosque was built to commemorate military campaigns against the Maratha king Shivaji Bhonsle, although construction of the mosque exhausted the Mughal treasury and weakened the Mughal state. 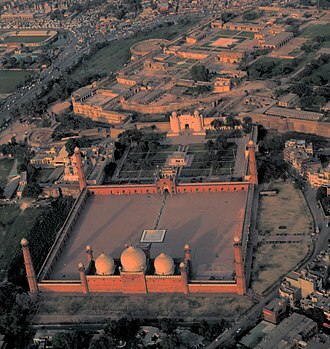 As a symbol of the importance, it was built directly across from the Lahore Fort and its Alamgiri Gate. Aurangzeb had the mosque built in order to commemorate his campaigns against the Maratha leader Shivaji Bhonsle. After only two years of construction, the mosque was opened in 1673, on 7 July 1799, the Sikh army of Ranjit Singh took control of Lahore. In 1818, he built an edifice in the Hazuri Bagh facing the mosque, known as the Hazuri Bagh Baradari. Marble slabs for the baradari may have been plundered by the Sikhs from other monuments in Lahore, in one of these bombardments, the forts Diwan-e-Aam was destroyed, but was subsequently rebuilt by the British. Gilgit-Baltistan, formerly known as the Northern Areas, is the northernmost administrative territory in Pakistan. Gilgit-Baltistan is part of the Kashmir region that is disputed by India and Pakistan, along with Azad Kashmir, Aksai Chin, the Shaksgam Valley, and Jammu, the territory of present-day Gilgit-Baltistan became a separate administrative unit in 1970 under the name Northern Areas. It was formed by the amalgamation of the former Gilgit Agency, the Baltistan district and several small former princely states, scholars state that the real power rests with the governor and not with chief minister or elected assembly. The population of Gilgit-Baltistan wants to be merged into Pakistan as a fifth province. Gilgit-Baltistan covers an area of over 72,971 km² and is highly mountainous and it had an estimated population of 1,800,000 in 2015. Gilgit-Baltistan is home to five of the eight-thousanders and to more than fifty peaks above 7,000 metres, three of the worlds longest glaciers outside the polar regions are found in Gilgit-Baltistan. Tourism is mostly in trekking and mountaineering, and this industry is growing in importance, the rock carvings found in various places in Gilgit-Baltistan, especially those found in the Passu village of Hunza, suggest a human presence since 2000 BC. Within the next few centuries after human settlement in the Tibetan plateau, this region became inhabited by Tibetans, today Baltistan bears similarity to Ladakh physically and culturally. Dards are found mainly in the western areas and these people are the Shina-speaking peoples of Gilgit, Chilas and Diamir while in Hunza and in the upper regions Burushaski and Khowar speakers dominate. 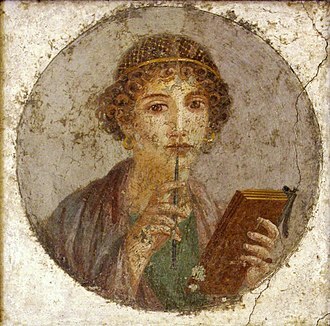 The Dards find mention in the works of Herodotus, Megasthenes, Ptolemy, in the 1st century the people of these regions were followers of the Bon religion while in the 2nd century they followed Buddhism. 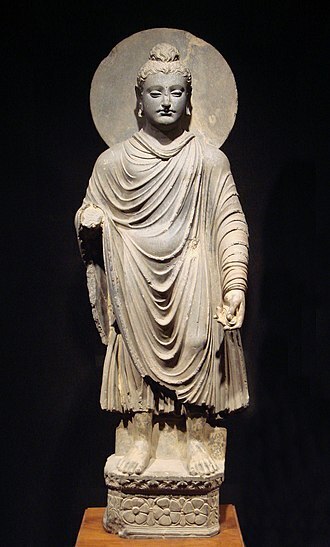 Between 399 and 414, the Chinese Buddhist pilgrim Faxian visited Gilgit-Baltistan, between 627 and 645, the Chinese Buddhist pilgrim Xuanzang travelled through this region. From 644 to 655, Navasurendrādityanandi was King of Palola, in 706/707, Jayamaṅgalavikramādityanandi became king of Palola. It is said that in the year 717, a delegation of a ruler of great Palola, named Su-fu-she-li-ji-li-ni according to the transcription of Chinese characters, in 719, Su-fu-she-li-ji-li-ni, King of Palola, sent a second delegation to the Chinese Imperial court. By at least 719/720, Ladakh was part of the Tibetan Empire, by that time uddhism iwa practiced in Baltistan and Sanskrit was the written language. It is unknown if Baltistan temporarily w sPruled under alolo. at that time 7In 20, thl deegation of Sou-lin-to i che, King of Palola, the Emperor gives the ruler of Cashmere, Tchen-fo-lo-pi-li, the title of King of Cashmere. By 721/722 Baltistan had become part of the Tibetan Empire, during 721-722 the conquest of Little Palola or Bru-zha by the Tibetan army failed. Mo-ching-mang had become the King of Palola by this time which was visited by the Korean Buddhist pilgrim Hyecho between 723-728, in 737/738, Tibetan troops under the leadership of Minister sKyes-bzang ldong-tsab conquered Little Palola. Khaplu is the administrative capital of the Ghanche District of Gilgit-Baltistan in Pakistan. Lying 103 km east of the town of Skardu, it was the second-largest kingdom in old Baltistan of Yabgo dynasty and it guarded the trade route to Ladakh along the Shyok River. Khaplu Valley is 103 kilometres from Skardu and two hours by jeep and it is a sprawling village located at the confluence of the Indus and the Shyok Rivers in Pakistan. Skardu is a base for trekking into the Hushe valley which leads to Masherbrum mountains, many famous mountains, such as Masherbrum, K-6, K-7, Sherpi Kangh, Sia Kangri, Saltoro Kangri and Siachen etc. are located there. 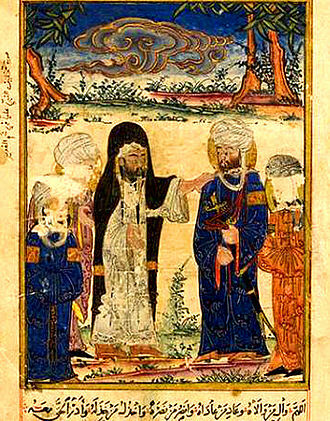 The first mention of the small kingdom called Khápula is in Mirza Haidars famous work Tarikh-i-Rashidi. The author lists Khaplu district of Balti, Khaplu was due to close political and family ties with the royal family of Ladakh, in this neighboring country in the 17th and 18th century proven to be very well known. Khaplu probably first visited by Europeans by Captain Claude Martin Wade, william Moorcroft & George Trebeck described Khaplu as follows, Kafalun is a province west of Nobra, on the left bank of the Shayuk. Godfrey Thomas Vigne has Khaplu 1835-1838, relying in particular on the mountain fortress. Alexander Cunningham, who did not visit Baltistan, published in 1854 a brief description of Khaplu. Thomas Thomson traveled in November 1847 and briefly described a place of beauty for Tibet. Knight reported on his visit to Khaplu, This fair spot what Kapalu, the richest district in Baltistan, jane E. Duncan reached Khaplu in 1904 and held there for three weeks. A detailed report on their stay in Khaplu is well worth reading, de Filippi, who reached Khaplu 1913, characterized the site as follows, It is, the loveliest oasis in all the region. Further information on Khaplu was on a report by Arthur Neve. Recent descriptions can be found in the guidebooks Arora, pp. 211f, Lonely Planet, pp. 306f and Beek, the area around the mouth of the river in the Thalle Shayok formed the western border of the kingdom. In eastern Hushe / Saltoro Tal was in Haldi another fortress, most important defense system was viewed as militarily impregnable fortress in the town of Khar Thortsi Khaplu Khaplu has been called many names like Shyok Valley and Little Tibet. The Walled City of Lahore, known as the Old City, or Androon Shehr, is the section of Lahore, Punjab, in Pakistan, that was fortified by a city wall during the Mughal era. It is located in the part of the city. 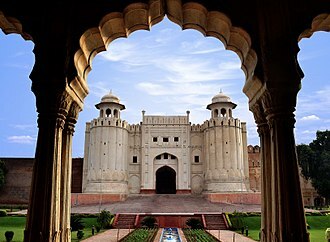 The origins of the original Lahore are unspecific, according to carbon dating evidence of archaeological findings in the Lahore Fort, the time period may start as early as 2,000 BCE. Lahore had many names throughout its history, Mohallah Maulian represents one of the two most probable sites of the original Lahore. Sootar Mandi inside Lahori Gate, had been called Mohallah Chaileywala Hammam located in Machli Hatta Gulzar, just off Chowk Chalka. The curve of Koocha Pir Bola merges with Waachowali Bazaar, the Lahori Bazaar merges with Chowk Lahori Mandi, along Lahori Bazaar, a short distance from Chowk Chakla, the street opens slightly, revealing a half-buried archway of pucca bricks and mud. The mud fort may have built by Malik Ayaz, the first Muslim governor of Lahore. Lahori Gate served as the entrance to Ayazs mud fort. Chowk Sootar Mandi constituted one important center of Kacha Kot, the lay of the streets suggest the boundaries. At the time of Mughal Emperor Akbar, the wall of the Walled City of Lahore stood, on the western side. On the eastern side to the left of Shahalam Gate, curved eastwards, thus the Lahore of the kacha kot era has continued to expand in three major leaps of expansion, each with an almost 400-year gap. The eras of Raja Jaipal of Akbar and of Maharaja Ranjit Singh mark the high points of that expansion, the story of kacha kot has been determined by those factors. The oldest buildings in the entire Walled City exist in this area, a huge hammam may have stood during the kacha kot period. The tomb of Pir Bola still exists, little remains of the original mud fort. The Walled City of Lahore covers an area of 256 ha with a population of 200,000, the city walls were destroyed shortly after the British annexed the Punjab in 1849 and were replaced with gardens, some of which exist today. The Circular Road links the old city to the urban network, access to the Walled City is still gained through the 13 ancient gates, or their emplacements. The Noor Mahal was the seat of the city's ruling Nawabs. Darbar Mahal was built by Nawab Bahawal Khan V in 1905 as a palace for his wife. Derawar Fort was originally founded as a Bhatti fort in the 9th century CE, and rebuilt in 1732 by Nawab Sadeq Mohammad Khan as a tribute to Rawal Deoraj Bhatti, the king of Jaisalmer and Bahawalpur. The fort was initially known as Dera Rawal, and later referred to as Dera Rawar, which with the passage of time came to be pronounced Derawar, its present name. A view of the mosque's main prayer chamber from the courtyard. A bat skull next to a ruler used to measure size. A finch egg next to a dime; a person familiar with the size of a dime would thereby have a sense of the size of the egg. Forced perspective illusion wherein the perceived size of the Sphinx next to a human is distorted by the incomplete view of both, and the appearance of physical contact between the two. Tilla Chenab beside Rabwah and between Rabwah and the Chenab River. The 17th century Dai Anga mosque's exterior is richly decorated with qashani tile work.